As the weather heats up, a mid or post run dip in a cold body of water makes for a refreshing break or finale. But if you have run in Seattle with any regularity, you’ve likely lapped Green Lake countless times and may feel a bit squeamish about what lies beneath. Sure, there’s Seward Park and Madison Beach, but, like Green Lake, these summer favorites are often packed and along the beaten path. This month’s On the Blog features lesser-known and creative alternatives to Seattle’s more popular swimming holes. The Discovery Park loop itself is no secret; neither are its major beaches. However, while running, walking, hiking or otherwise traversing the North Beach Trail sans automobile, one can access a fairly secluded beach nestled among the trees. 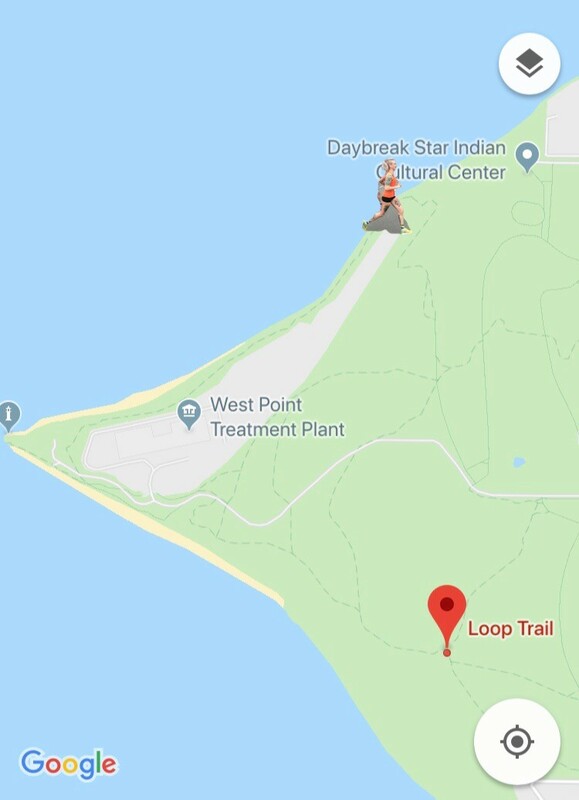 If heading north from the lighthouse, runners will come across the beach just before beginning the ascent from the trail. Often quiet and sparsely populated, this hidden gem provides the perfect pit stop for those on foot looking to bury their toes in the sand or take a brisk plunge into Puget Sound (pictured above). Peek-a-boo views of Carkeek Park’s beaches and the hypnotic sound of water breaking along the shore make it the ideal stop for rejuvenating mind, body, and spirit before embarking on a hefty climb. This next recommendation is brought to you by Laura Goodfellow, Seattle’s very own Transit-Oriented Runner. Laura has turned her passions for public transit and running into a community project. In addition to documenting her journeys on transit and on foot, she leads a monthly group run that involves travel using Seattle’s various forms of public transit, from Metro to the West Seattle Foot Ferry. Laura eagerly shares her experiences through social media platforms. Runners and transit-lovers alike can find her on Strava, Facebook, and on Twitter at @transitrunner. Bainbridge Island is great for running, especially for those who like hills. I've only run there 5 times but every time has been a great experience. For those who like trails, the Grand Forest is nice. Otherwise there are plenty of quiet, scenic roads. I have especially liked Manzanita Road and Manitou Beach Drive because they have little traffic and beautiful views of the water. I haven't run on the southern coast of the island yet, but I suspect that is equally pleasant. However, make sure to avoid Highway 305 as much as possible because it has high traffic volumes and is not pedestrian-friendly. Miller Road & Fletcher Bay Road are also not the best for running as they have moderate traffic with no shoulder, but they are doable and I've run on them a few times. One could start their run right when they get off the ferry. The downtown area, "Winslow", right by the ferry terminal, is very cute and very walkable. There's a lot of great places to get a meal or a snack after finishing a run and while waiting for a ferry back to Seattle. The Seattle Tennis Club and gated mansions line much of Lake Washington between the Madison Park beachfront and the beaches and marinas scattered along Lake Washington Blvd leading up to Seward Park. Tucked in between two especially magnificent homes is none other than Seattle’s Denny/Blaine Park. While this park is no secret, the clothing-optional aspect and inclusive atmosphere render it an optimal spot if you are on foot or bike and traveling light--No swim gear to carry and no wet clothes to pack out on the return trip! Queer and family-friendly in addition to being prime Lake Washington waterfront, Denny/Blaine sees its fair share of human and car traffic during the summer; beachfront can be hard to come by. So, plan your approach by foot or bike, shed as much clothing as you are comfortable shedding, and cool off in the lake before pounding more pavement. As this is Seattle, the Grease lyrics lend themselves well to a runner’s remix: Summer runnin,’ had me a blast / Summer runnin,’ happened so fast / I found a route cool as could be / Took a dip rather chilly / Summer days driftin’ away / To ah oh those dark winter nights. For now, though, the warm weather is upon us. Why not jump in water mid or post run? It is as important to stay cool as it is to stay well hydrated, right? Happy summer running, all!